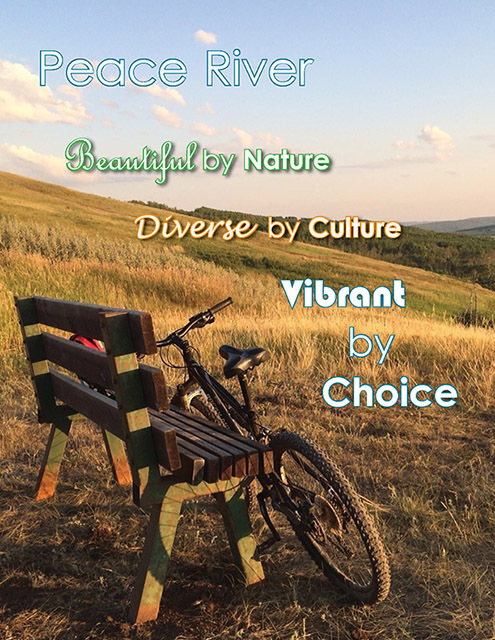 Moving to Peace River means moving to a vibrant and wonderful community. Peace River residents and visitors are privileged to enjoy one of the most beautiful physical settings in Alberta. The town is located 486 km north-west of Edmonton and 195 km north-east of Grande Prairie, is the second largest center in north-western Alberta and functions as a thriving regional service and trade center. The Peace, Smoky and Heart Rivers converge near the town and from surrounding outlook and observation areas such as Sagitawa Lookout and Twelve Foot Davis Gravesite, we are treated to an outstanding view of the river valley below. With over 500 rooms available to visitors at local hotels and motels it’s easy to stay here. The beauty of the natural valley and hills offers the ideal setting for photographers and outdoor enthusiasts, while z wide range of businesses, shopping, dining and lounges are featured throughout the community.Hiking, cycling and walking trails are featured throughout town and campers enjoy an abundance of outdoor facilities, with others just a few minutes drive from town, as well as picnic areas, interpretative trails, 9 and 18 hole golf courses, secluded fishing spots and much more. Visitors and residents alike enjoy our many parks and playgrounds for local events, gatherings and picnicking, with lots of room for the kids to play. Winter visitors can ski the slopes of Misery Mountain, located on the west side of town, go cross-country skiing along one of the many trails in the valley, or tobogganing at one of our local hills. The Mighty Peace River is 1300 kilometres in length, and flows through two provinces. The Peace River has undeniably shaped and influenced all who have lived here. From the beginning, the community of Peace River has had a deep connection to the resource rich environment that runs along this mighty river. The Peace River was historically an important source of sustenance and transportation for the early Beaver Nation, the Cree Nation and early Europeans. As a river of commerce, it became a vital backdrop to the Canadian fur trade industry until the late 1800s. Early in the town’s development, ferry crossings, steamboat operations, and later float plane and bush plane companies set up their headquarters in the town and provided access to more remote areas in the Peace Country. Today, the river is an important part of community identity, providing for a number of activities including fishing, recreation, travel, transport, industrial, and environmental uses. Town of Peace River, Community Services Dept. Provides community information and referrals to community based services. Information about Municipal services, such as taxation, utilities, sanitation and curbside recycling program, as well as general community information. The old Northern Alberta Railways building now operates a Tourist Info Centre. Your link to the vibrant history and heritage of the Peace River area as well as general community information. Stop in and visit our friendly staff and purchase locally made items from the gift shop. 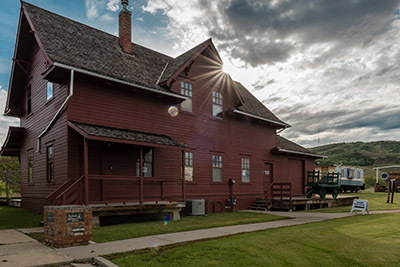 This tourism center and museum, built in 1916, is a must-see for all visitors and residents of Peace River. Seasonal events are held throughout the year. For more info, please contact the museum or connect with us on Facebook. Special site tours are also available by booking ahead with the Peace River Museum and Archives, please call (780)624-4261. The North Peace Housing Foundation is a housing management body established by Ministerial Order under the Alberta Housing Act. We provide a variety of housing options for seniors and low-income households in need throughout the North Peace Region. Seniors’ Lodges, Seniors’ Self Contained Apartments, Family Housing, Affordable Housing, and rent supplement. Métis Urban Housing Corporation (MUHC) is a Métis Nation of Alberta owned company that was incorporated in 1982 to provide affordable, adequate and appropriate rental housing for low and moderate income Métis (and other Aboriginal) families within the urban centers of Alberta. There are a number of Realtors in the community which are search-able online, or you can find their information in the phone book. Information on the Canadian Constitution, immigration, travel, business, benefits, health, taxes, jobs, employment insurance, Old Age Security pension, etc. Legal Aid Alberta offers coverage for many legal issues, but not all. Legal assistance is most often provided for: serious criminal charges; charges laid under the Youth Criminal Justice Act; family law issues; child welfare matters; civil law issues, such as employment, landlord/tenant and income support; and immigration/refugee claims. If your income falls within the qualifying range, you may be eligible for some of the following services: legal advice; brief services; and/or full representation. Representational services are not free. Repayment will be discussed with you if a lawyer is appointed. If you are looking for information about support services in general, whether they are government or local, but don’t know where to start. Call, click or come in to Alberta Supports! Income Support – financial assistance to Albertans who do not have the resources to meet their basic needs such as food, clothing and shelter. Health Benefits – eligible Albertans can receive health coverage for themselves and dependents to meet their health needs. Child Support Services – helps eligible parents with limited income to get child support agreements or court orders. Are you interested in enrolling your children in Peace River sports or activities, but need financial assistance to be able to make that happen? Phone us at 780-624-1000 to learn about our Community Services Community Scholarship or the Canadian Tire Jumpstart Scholarship opportunities. The Town of Peace River is a liaison for the Canadian Tire Jumpstart Program and also offers a youth activity scholarship for Peace River Residents. For forms, please go to www. peaceriver.ca. (780) 624-7620 Public health has various programs and services for newcomers. Please contact them for more information. Patients accessing these services will also be linked with a language bank if required. Subsidized taxi fares for seniors, low income individuals and families, students, AISH clients, or those with a medical or physical disability. Please call for more information. Peace River Municipal Library (9807 97 Ave.) No membership required. Social Media: Please keep in mind that other than Official Town of Peace River sites, the Town of Peace River does not operate, manage, facilitate or monitor external sites, and is not responsible for third party information. Employment Services – Includes career counseling, job fairs, workshops and information sessions to assist with resumes and interviews. Improve your English speaking, listening, reading, writing and numbers or reduce your accent. Improve your grammar in a group or one-on-one with Horizon Learning Centre. Call for more information. They also offer: Conversational Spanish for beginners or Conversational French for beginners. Information regarding resources for refugees and those looking to help them settle in Alberta. Patients accessing Alberta Health Services will also be connected with translation services as required. If you know of any additional support services in Peace River, please contact our office at 780-624-1000. We would love to be able to add further services to this listing.